It must have been the mid-nineties when I first got into Ernie Ball strings. You can chalk that up to old age, it’s been that long. I’m still using them, and they’re the first brand I’ll look at when I’m buying new strings. I’ll look at other brands to see if there are any deals, but in my old age, I do keep going back to what I know. I think it started back in my local guitar shop. They were just one of the few brands of strings they carried. I did favor the Hybrid Slinky for a bit – they essentially have the trebles strings from a set of 9s and the bass strings of a set of 10s – but as I focused on rhythm playing, they became less relevant. Throughout college and being a broke Millennial in the early days of my career, I did rely on other cheaper brands, but it was never quite the same. I think it was a couple of years ago that I got back to Slinkies – I think I got a deal on them. And I’ve used them exclusively since! There are always deals to be had, especially around holidays like 4th of July or Memorial Weekend, both online and instore. I normally love to talk about the parts and construction of things, but there’s not a lot to say about strings in that regard. 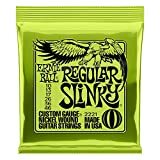 In saying that, many companies – Ernie Ball included – are forever marketing new types of super-innovative string designs, claiming to do this, that and the other. I’ve picked up some samples of strings marketed like that over the years, and to be honest, I never got over-excited by them. They didn’t make me a better player, didn’t dramatically change my tone… Sure some felt a little different to play, but not enough to make me bothered paying extra for it. As my guitar collection expanded and became higher end, I didn’t want to waste great guitars on lousy strings. A key consideration in expanding my collection was the different tones of the different guitars. That’s the whole reason guitars have so much consideration going into their construction. With that in mind, I like to let the guitars do as much of the work as possible. So, I keep my strings as regular as possible, so the tonewoods, and the pickups, and all the other bits that go into making an electric guitar can show why they’ve been constructed that way. The regular aspect of Regular Slinky strings comes from the balanced nature of the strings. By that I mean the treble strings are not intended to be any more trebly than the bass strings are bassy, or the middle strings are middly. Each pair of strings is intended to perform its role in formulating the sound, just as well as the ones next to it. Hmm… I’m not sure how to discuss this without boring you with tales and audio samples of how great all my guitars are. I guess whether it’s on a Les Paul, or a Strat, or whatever, these strings just bring out the integrity of that guitar’s sound. How do you rate the performance of your guitar strings? It’s been said that you should restring your guitars every six weeks. Well, OK, cool, but I can’t afford that. I try to change them every three months or so. Sometimes it’s longer, sometimes it’s shorter. These days, I’m a home player. I’m not going to practice for two hours every week, nor am I playing half hour sets a couple of types a month. What I’m saying is that my strings aren’t going to get the heavy usage of a professional, or even a more avid intermediate guitarist. And my Regular Slinky strings do me just fine for that period of time. It’s about every three months that I start to notice them becoming a little bit duller. And that’s OK. It’s a manageable duration. I’m definitely a bit of a brand evangelist for Ernie Ball strings, and especially the Regular Slinky line. I have them on all my electric guitars. I have a set of Regular Slinky Bass on my bass guitar, and if I ever get a seven-string guitar, I’m 100% sure the first change of strings it gets, will be a set of Regular Slinky seven-strings. It’s interesting to note that on Amazon, buying the sets of strings individually works out cheaper per packet than buying multi-packs. That’s just something you should watch out for. I’ve been using Regular Slinky strings for years. I tried others, I came back. I think that in itself demonstrates how great these strings are.